Epimetheus (ep'-i-mee'-thee-us, Greek Επιμηθεύς) is a moon of Saturn. It is also known as Saturn XI. It is named after the mythological Epimetheus. Audouin Dollfus observed a moon on December 15, 1966, which he proposed to be named "Janus". 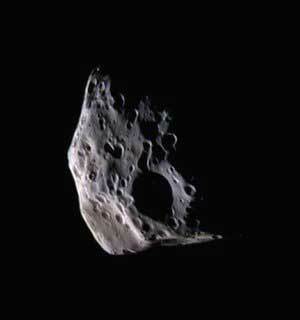 On December 18, Richard L. Walker made a similar observation which is now credited as the discovery of Epimetheus. 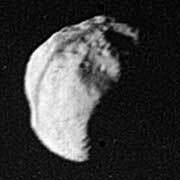 However, at the time, it was believed that there was only one moon, unofficially known as "Janus", in the given orbit. Twelve years later, in October 1978, Stephen M. Larson and John W. Fountain realised that the 1966 observations were best explained by two distinct objects (Janus and Epimetheus) sharing very similar orbits. This was confirmed in 1980 by Voyager 1, and so Walker officially shares the discovery of Epimetheus with Larson and Fountain. Epimetheus and Janus are "co-orbital". Janus' orbital radius from Saturn is 151,472 km and Epimetheus' orbital radius is 151,422 km, a separation of only 50 km. Since closer orbits have higher velocities the two moons must inevitably approach each other, and since Epimetheus' diameter is 115 km and Janus' is 178 km it would seem at first glance that a collision is also inevitable. But as the inner moon catches up with the outer moon their mutual gravitational attraction boosts the inner moon's momentum and raises its orbit, causing it to slow down. The outer moon loses an equal amount of momentum and drops into a lower orbit at the same time, speeding it up. The moons thus "trade" orbits and begin moving apart again, without actually approaching each other closely. The exchange takes place about once every four years; the next closest approach is in Jan/Feb 2006. This arrangement is unique in the solar system, as far as is currently known. Other unusual orbits include the retrograde orbit of Triton around Neptune, and the "horse-shoe" orbit of Cruithne and (potentially) dozens of other objects in similar orbits .